She is grateful to consider herself a citizen of the world. 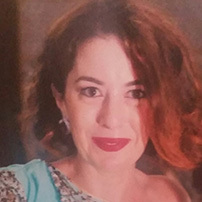 Dr. Oumaya Belakbil is a Clinical psychologist practicing in Casablanca serving the local and the expat community. She is a firm believer in community based programs promoting self actualisation in a holistic and integrative approach, where people are brought together to promote their inner resourcefulness. After serving mainly the immigrant population in the Washington DC area, she moved back to Casablanca. The urge of being useful to the local community and to share her experiences led to volunteer at the 1st Child Psychiatry Clinic at the Children’s Hospital and to teach pro bono at the Casablanca Medical School. She also opened a private practice, where she currently work with the local and international community. Throughout her work, individuals with different life journeys seek to constantly create meaningful relationships and lives. They share their painful journeys with humility, and each one of them inspire her every single day to continue pursuing and implementing different ways to help them meet their goals. She strongly believes that with the right tools individuals can access their inner potential and achieve their goals.